1. Air pressure within the cartridge is regulated by an outlet hole, which must be sealed to prevent leakage during refilling. Use strong adhesive tape to seal this aperture (Picture 1). DO NOT TAPE THE COPPER PRINTHEAD! 2. See Picture 2. 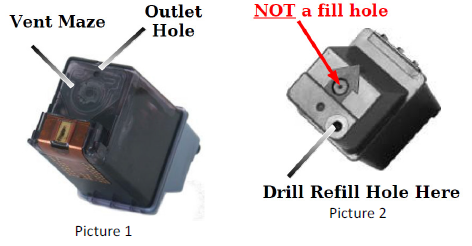 If you have an opening already on “Drill Refill Hole Here”, then just push the ball bearing into the cartridge. Otherwise, drill a hole there. 4. Clean off the top of the cartridge. Seal the refill hole airtight using tape or glue gun. If your cartridge is leaking afterward, then the refill port is not airtight.